There are two issues that persist in the work I perform for clients. One, of course, is Merchandise ... a nearly forgotten concept in modern marketing. 24 of the past 29 Merchandise Forensics projects illustrated a merchandising challenge that is holding back the business. The other issue, of course, centers around a fundamental misunderstanding about customer purchasing habits. Look at this graph. 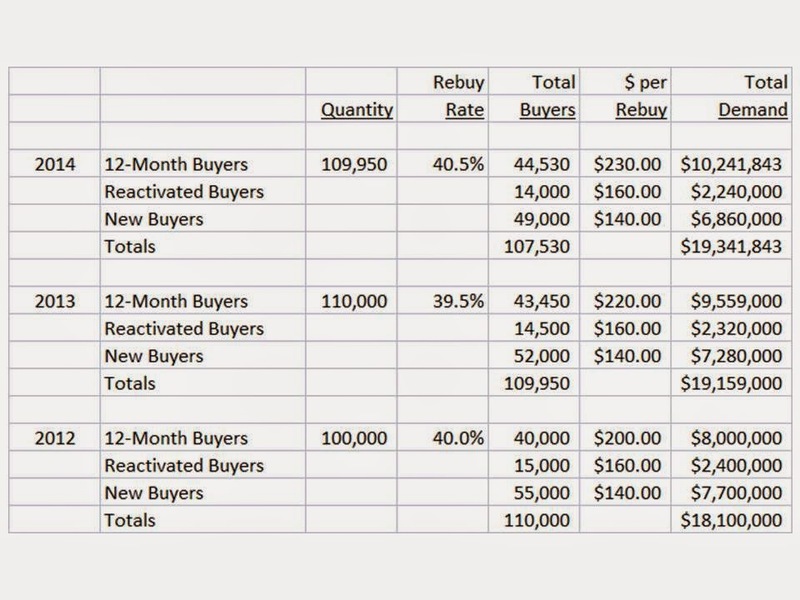 Here, we measure the annual repurchase rate of customers as the customer moves from a first-to-second purchase, then a second-to-third purchase, and so forth. The blue bars represent total repurchase rates (mail + phone + e-commerce) for catalog business models. The green bars represent total repurchase rates for e-commerce-only business models. You should observe two things that cause you to think carefully about your business. First, and most obvious, is the fact that catalog business models are far more efficient at converting a first-time buyer to a second purchase. This is a consistent trend that I observe across my client base. Because the customer is instantly pummeled by catalogs after a first purchase, the customer tends to be more responsive, and therefore, repurchases faster. This is one advantage that catalogers have over e-commerce-only business models. E-commerce-only business models struggle to build a relationship with a customer ... e-commerce is transactional, cataloging is relational. Second, and more important, is the fact that as the customer becomes loyal, the customer has the same repurchase rate, regardless of business model. Here, the catalog industry grossly overstates the importance of a catalog. When customers become loyal, customers buy because customers love the brand, not because customers love the marketing strategy. It is harder for the e-commerce-only business to move a customer along to loyal status, but rest assured, when the customer becomes loyal, the customer buys just as often as at any other business (just ask Amazon or eBay). This is where catalogers need to step back and throw out thirty years of collective experience. The instinct of the cataloger is to attribute/matchback every single order observed to a catalog. And because the cataloger mails 12-75 times per year, the cataloger will, undoubtedly, attribute/matchback every single order to a catalog. The cataloger must ask why the e-commerce-only business model has the same loyalty as the cataloger, but does not mail any catalogs? How is that possible? And what might happen if the cataloger cut back on catalogs to loyal buyers? There are two major takeaways for you. E-commerce-only businesses have a lot to learn from catalogers about how to build customer relationships after a first purchase, because catalogers are simply much smarter at this than are e-commerce-only businesses. Catalogers have a lot to learn from e-commerce-only businesses about creating customer loyalty. If an e-commerce-only business can achieve loyalty without mailing a single catalog, it suggests catalogers have completely misread what causes loyal customers to purchase (hint = merchandise). A good marketing/analytics system should be able to detect when the Management Team is actively trying to steer a business out of a problem. Look at this table. Here, new buyers decrease from 55,000 in 2012 to 52,000 in 2013 to 49,000 in 2014, similar to yesterday. And yet, sales do not decrease. Why? Look at $ per repurchaser - among 12-month buyers. This metric increases from $200 per customer to $220 per customer to $230 per customer, on an annual basis. When you see declining new buyer counts and increasing spend levels among existing customers, you realize that "management figured out something is wrong". In other words, Management may not be able to fix the new customer problem (yet), but they realize that there is a problem, so they goose the top-line by getting existing customers to spend more. Of course, this doesn't mean that Management figured out how to fix the business. Not by a long shot. It just means that Management has reporting to help them understand that something is wrong, and is trying to keep the ship afloat. FYI - this table was very, very common in 2007, prior to The Great Recession. And it is very common in 2014 - in the in-store retail purchase channel. In retail, we're seeing new customer count issues, and in response, we see Management offering 20% off and 30% off and 60% off in an effort to get the traffic they have to buy something. By the way, if the customer really demands omnichannel solutions, then as you install your omnichannel strategy, you should see an explosion of new customers, should you not? What is your reporting telling you about the success of your omnichannel strategies? P.S. : If you don't have the resources to run a project of this nature and want my help, then click here data/cost details ... kevinh@minethatdata.com. Any marketing/analytics system should be able to quickly identify a business issue. One of the problems with modern analytics software is that the software tends to be campaign centric - meaning that software identify problems with campaigns, not problems with businesses. In most of the businesses I analyze, there is a canary in the coal mine ... a metric that helps determine that something is wrong. That metric, of course, is the number of new customers. The example above is very, very, very common. 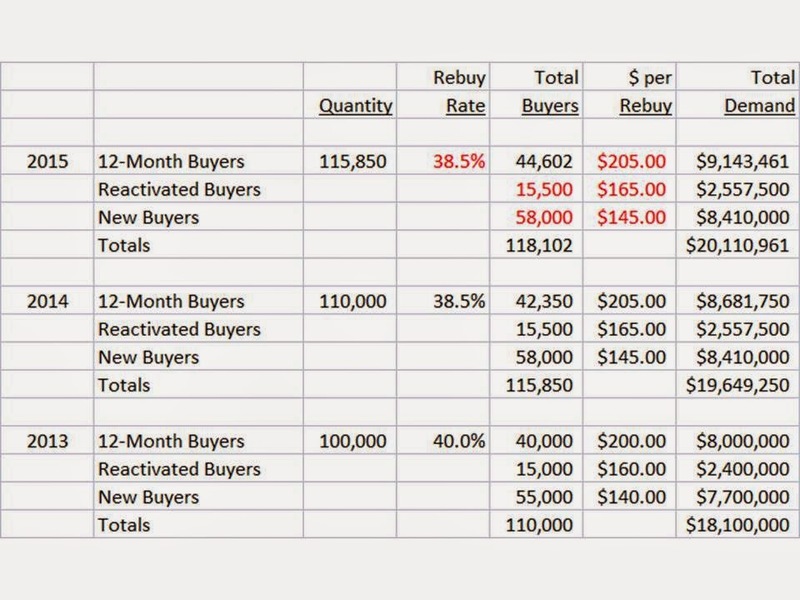 Look at the annual repurchase rate ... it is essentially flat. This means that existing customers are remaining loyal. Now look at spend ($ per rebuy). That metric is also flat. Customers are spending the same amount, year-after-year. The metric that is changing is the number of new buyers ... down from 55,000 in 2012 to 52,000 in 2013 to 49,000 in 2014. This metric, of course, does not impact sales in 2013 - sales still increase - but the cumulative impact of poor new customer counts does send the business into negative growth territory in 2014. I always look at new customers - it's the canary in the coal mine. By the way - I frequently observe this table in modern retail in-store buying - store sales are tepid largely because the number of new customers is in decline. I'll be in Seattle on Tuesday afternoon - slots are filling up fast, so if you want to meet, send me a quick message (kevinh@minethatdata.com). P.S. : Speaking of conferences, join me in New Hampshire in February ... click here! I have all sorts of goodies ready to share for that one. In the comments section, ask a question, or email me your question (kevinh@minethatdata). If I get a reasonable number of credible questions, I will create a blog post series around your questions. Here are some of the questions I field. How do I acquire a new customer without spending money or without giving away margin dollars via discounts and promotions? Why is it so hard to reactivate older customers? Before the economy collapsed, reactivated customers were a gold mine. It's almost like the customer has no memory anymore. I sell branded merchandise, and you seem to have no answers for improve my business. How can I compete when everybody else is selling what I am selling? Showrooming is overrated. Your mobile and e-commerce presence actually help stores, though it doesn't seem to manifest itself in sales increases. I guess I don't have a question, I just really enjoy joining the omnichannel discussion. Why don't Executives ever listen to what I have to say? Why don't Analysts ever produce actionable findings? Everybody says I have to be omnichannel, but the customers I acquire from all those other channels have low value and tend to not scale to manageable quantities. Am I doing something wrong? Can I grow my business by extending existing product categories? Can I grow my business by cutting styles by 30%? 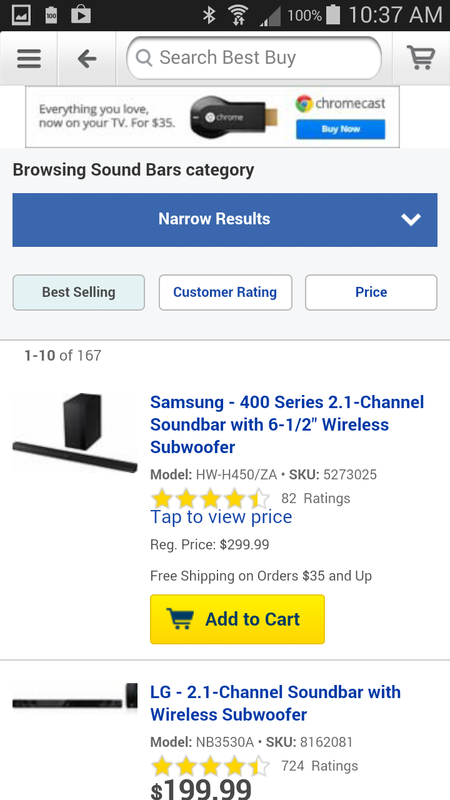 Can I get my customers to spend more by offering unrelated product categories? What do I do if the vendors I source my merchandise from are constraining their merchandise assortment? Long-term, won't this hurt my business? More than half of my file purchases via discounts and promotions. How do I reverse course and get my file purchasing merchandise at full price once again? Is there any way to pivot my business from a 65 year old customer to a 45 year old customer while still selling the same merchandise assortment and still mailing a lot of catalogs? Can we just employ a best practice for creative that appeals to a 45 year old? Why aren't customers age 25-34 as loyal as the rest of my customer base? Why are the three months following a first purchase so darn important? We raise prices on new merchandise, but find that our customers are then less likely to embrace new merchandise. How do we ever achieve acceptable gross margins when our customers simply won't spend enough money with us? Don't you think that the environment out there is so promotional that we must also be promotional, or we'll be out of business? Should we respond to what our competitors are doing, or should we chart our own course? Our business model is so unique that what you talk about is meaningless to us. How could anybody possibly help a company as unique as ours? Does it matter if my customer is 70 years old? Sure, my customer was 55 years old in 1999, but now that my customer is retiring, won't every customer who will retire in the future pass through my niche, thereby enabling my business to reap the rewards of a properly managed business model? Why do I need a younger customer when Baby Boomers have all the money? Why are more than half the names given to me by the co-ops not buyers from the product category that comprises my business model? Why are so many conferences employing some version of "pay to play"? Do conferences not earn enough money from those in attendance? Can I trust the message offered by the conference organizers if vendors are paying for speaking slots? How can I ever come up with enough truly new, unique merchandise when my competitors knock-off what I invent within six weeks, and sell the knock-offs at a lower price? Isn't it more important to focus on the customer than it is to focus on merchandise? Without a customer, you cannot sell merchandise, correct? Therefore, marketing is more important than ever, and that's where I need to spend my energy. Besides, our merchandise is fantastic, amirite? Doesn't it make logical sense that if I outsource my marketing activities to smart vendors then my business should improve significantly? Hiring the best talent at the lowest possible price has to be good for business, right? Why is it that we keep making improvements to our website, we keep improving conversion rates, and yet, sales don't increase? How is that mathematically possible? Isn't it smarter to be a $100,000,000 business earning $5,000,000 profit per year than a $90,000,000 business earning $9,000,000 profit per year? Who cares about profit when you can earn market share and damage the competition in the process? How do I get my customer to act the same way in all channels? Am I going to be required to offer the customer free two day shipping in the future, and if so, what promotional levers will I be able to use, because free shipping promotions really goose sales when business is slow? Does it make more sense for me to be a vendor to Amazon than to continue as a standalone direct marketer? Who is an attribution vendor who "gets it"? Don't you think that if we could nail the attribution issue that we would know where we should spend money, and as a result, we'd be much smarter marketers? Isn't attribution the thing that is holding us back? This is like a puzzle, and we just need somebody to show us how the pieces fit together. Why does the industry struggle with this concept? And could you tell us, for free, how the pieces fit together? Why do you write so many blog posts? I'd be a lot happier if you spammed me less. And while I am at it, why not offer your loyal readers more free, actionable information? How could you possibly grow a business without a catalog? It's got to be impossible, don't you think? Name one brand that was able to get past $100,000,000 in annual sales without a catalog? How could you possibly grow a business using a catalog business model? I mean, sure, customer loyalty would improve, but at what cost? It's too expensive to put paper in the mail, and nobody under the age of 50 even cares, right? Retail is doomed, don't you think? What do you think is the next innovation in omnichannel retailing? This has to be the most exciting time ever, in retail. I just love seeing how everybody responds to the omnichannel movement. How do we ever get a customer to care about email marketing? Unless we offer 20% off or free shipping or some sort of gift, we don't have any engagement. Is email really just a promotional channel for customers who don't want to pay full price for our merchandise? Why do vendors, trade journalists, conference organizers, and consultants obsess about social media when almost nobody generates any business from social media? Is it possible that the rules that drive business for vendors, trade journalists, and consultants are fundamentally different than the rules that drive my business, or are these people really misguided? Our whole business model is based on traffic from Facebook and Google. What do we do when Google changes their algorithm and we're unfavorably impacted? Why is it so hard to find one personalization case study that increased total company net sales by at least 10%? Isn't it better to mail an individual customer 35 catalogs a year instead of 25 if it means that the customer spends more? Isn't it better to have a big customer file than a profitable customer file? I have a catalog. I have a website, fully integrated with the catalog. I have an app, for free no less. I fully leverage Facebook, Twitter, Pinterest, and Instagram. I use A/B testing to optimize my website. I use a leading catalog contact frequency vendor. I partner with all the major co-ops. I have up-sell and cross-sell programs. I have triggered email programs. I pay the best search vendor a pretty penny to capture the customer on Google. I pay affiliates for 5% of my orders. I pay a newly formed catalog agency for thought leadership. I make sure that every single visitor to our website sees retargeting ads, even if the visitor is engaging with sites that have nothing to do with commerce. I have YouTube videos, one even managed to go viral. I pay agencies for social media sentiment. My net promoter score is in the top 10% of my industry. I spent a year building a world-class customer database, allowing my staff to answer any question they can imagine. I have a loyalty program for my best customers, I give 20% off plus free shipping for first-time buyers. I'm doing everything right. And my sales are not increasing. Why? A show of hands ... how many of you measure how often good customers visit your website, on a monthly basis? I know, I know, the percentage of affirmative responses is under 10%. Go measure active visitors on a monthly basis. If these folks are visiting an average of ten times a month, then why in the heck are you obsessing about optimizing conversion rate? Seriously, why? The customer is coming back every third day ... do you care if the customer converts today or Saturday? No. You just care that the customer converts this month. But because you are obsessed about conversion, you offer 30% off plus free shipping ... and you get the customer to bite ... even though the customer would have bitten three days later anyway. Measure this stuff with a purpose - you want the customer to buy something this month, not this specific visit. The more you focus on this specific visit, the more you beg the customer to buy something via discounts and promotions and phony optimization, costing your business the profit your merchandising team has worked so hard to generate. I frequently talk about the 2005-2006 timeframe at Nordstrom, when we killed a traditional catalog business, pulling $36,000,000 of advertising out of the mail, and still grew net sales. You try pulling $36,000,000 of advertising out of the mail and still grow sales! It's not easy. Especially if you don't have a plan. I recall sitting in the office of the Inventory Executive at Nordstrom Direct. This was a well-seasoned professional. She had no faith in "the plan" - and for good reason - she was a "data driven" person, and the "data" suggested that without catalogs, you would not generate sales online. Yup, that's what the data said. But there was a plan. Yes, it was a plan based on faith. There wasn't data to suggest that the plan would work ... this was 2005, after all. Stop renting names via the co-ops. Take Nordstrom names off the list rental and co-op market, permanently. Remove $36,000,000 of catalog mailings from the mail stream. Move $15,000,000 or more into paid search. Integrate the merchandise across channels. Work as a team - encourage in-store associates to promote the website. Produce a monthly catalog whereby each page was sold to vendors for $29,000 each - vendors picked the merchandise that appeared on the page. That plan, as outlined right there, sure doesn't inspire confidence, does it? That plan had to recoup $150,000,000 in annual net sales. And when we mailed those vendor-funded catalogs and realized we'd only recoup $20,000,000 in annual net sales, well, geez, that didn't sound too good. But then time progressed. Customer behavior shifted. We lost most of the customers who generated the $150,000,000 of catalog demand, and ultimately replaced them with $165,000,000 of online demand generated by customers who were much younger, and who liked the new assortment (which in many ways mirrored the retail assortment). I get it. You come up with plans all the time - and your Finance team or Analytics team beat you over the head because you cannot prove that your plan will work. Yes, you're going to be wrong, often. But if you listen to the Finance team, and if you listen to your Analytics team, you will never make anything more than tiny, incremental changes. You read Benedict Evans, don't you (click here for a sample article about Amazon - the image to the right is from that article). 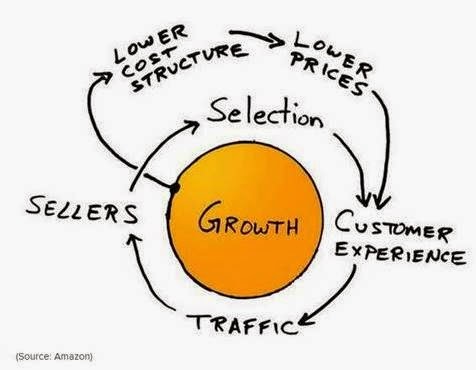 In this essay about Amazon, he cites this image, a refined version of one drawn on a napkin by Jeff Bezos. Look at the arrows, look at the words. Sellers and Selection ... that's Merchandise. Customer Experience? That's pretty important. The essence of Merchandise Forensics is outlined in the image above. Merchandise improves the customer experience, which drives traffic, which attracts sellers (your merchandise vendors) which improves selection which improves the customer experience. Is it possible that we're focusing on the wrong things, and that's why business isn't so great? A good marketing/analytics system should be able to quickly diagnose the impact that merchandise has on business struggles. I use the comp segment analysis to identify merchandising problems. Trust me - the comp segment analysis quickly identifies merchandising problems! In this case, look at the online, in-store, and total columns, especially in the past two years. Both channels exhibit sales declines. Comp segment performance dropped by 4.5% in 2013, and has dropped by 6.0% in 2014. This, my friends, is a business that is suffering from a bad merchandise productivity problem. I cannot tell you how many meetings I've been in where the Executive Team calls the Marketing Team into the conference room, and then beats the marketing folks silly over sales declines. Then the marketing team performs a wonderful song and dance, trying to deflect blame while maintaining accountability. Most often, both sides have incomplete data. 80% of the time, I observe the situation outlined above. Customers are comparable, and spend by channel is in decline across all channels. This is a business that is suffering from a major merchandise productivity issue. The issue, in this case, is merchandise. Customers don't want to buy the merchandise being sold by the company. My system quickly identifies the problem, and then allows one to dig in further, to uncover why there is a merchandising challenge. The goal of any system is to eliminate doubt, to enhance clarity. There's simply too much data available today, and most of it is campaign-centric, meaning that few people can actually diagnose a business problem ... meaning that most can simply observe that a business problem is happening. Did you end up with a bunch of free U2 songs on your device, even if you have absolutely no interest in the band whatsoever (click here)? I know, I know, you are a marketer and you think Apple did something noble by paying U2 $$$ to give you access to free music. It's a "gift without purchase"! Unless you don't like U2. Then what do you think it is? The number one question I'm fielding here in late summer is this one ... "why, beyond our loyal customer base, are the rest of our customers defecting"? I see this, over and over and over again. Loyal customers largely hang in there ... while the middle and the bottom of the customer file falls away, slowly. It's what is killing retail. It killed catalogers. I have to wonder ... do infrequent customers trust us? Do they trust us when they take advantage of a free shipping offer, only to see 30% off plus free shipping two weeks later? If you are not a fan of U2, then Apple just gave up a slice of trust. You can probably get away with this a few times. Measure how infrequent customers perform. If infrequent customer productivity is on the decline, consider whether the customer trusts your business model. Remember yesterday's example (click here to remember the post)? You invest 8,500,000 catalogs with your printer, and with your co-op, in order to transform your business from a business that generates $2,500,000 of pre-tax profit on $50,000,000 in annual sales to a business that generates $55,950,000 in annual sales at break-even. It's time for you to have a heart-to-heart discussion with your vendor partners. Think about the co-ops, for instance. How much additional work do they have to do to put the last 100,000 of the 8,500,000 co-op catalogs in the mail? None. No additional work whatsoever. Zip. Zero. It's all profit. So why are you paying them $0.06 or $0.05 or whatever they are charging you for those additional, incremental names? The co-ops have your spending history - meaning they know, by year, what your investment level has been. So if you want to put an incremental 8.5 million catalogs in the mail, for crying out loud, they should be charging you just a penny a name to do it. They should be encouraging you to greatly overspend, shouldn't they? Profit for 8,500,000 catalogs at a 40% profit factor and $0.50 catalog cost and $0.06 co-op cost and $0.70 per book estimate = ($2,380,000). Profit for 8,500,000 catalogs at a 40% profit factor and $0.50 catalog cost and $0.01 co-op cost and $0.70 per book estimate = ($1,955,000). Look at that! You make an additional $400,000 because of co-op concessions. If you cannot afford to mail the names, they make $0. If they give you the incremental names at a penny each, they make $8,500,000*0.01 = $85,000 ... enough to hire one additional analyst or enough to simply pocket profit. Why are you not negotiating with the co-ops in this fashion? Profit for 8,500,000 catalogs at a 40% profit factor and $0.48 catalog cost and $0.01 co-op cost and $0.70 per book estimate = ($1,785,000). You keep telling me that you'd rather grow than to generate pre-tax profit. Did I not outline a path for you to grow, throwing away all your profit in the process? This avenue causes three things to happen. Your business grows, and that's what you are telling me you want. Explain to me why this is bad for your vendor partners? I'm not asking them to lower prices on your base expenditure ... just every incremental dollar beyond your base expenditure. Explain to me why this is bad for your business? You keep telling me you'd rather grow top-line sales than profit. In this case, you grow top-line sales. Sure, you have no profit left, but you keep telling me you want to compete against Amazon - they don't generate profit - and they grow. You keep telling me that sales growth and customer file growth is more important than profit. Well - how important is it to you? This is your moment. Put your chips in the middle of the table and grow, or have me put an algorithm together for you to greatly increase profit. Pick one, or the other. But again, if you want to grow, then what I outlined here allows your business to grow, allows the co-ops to generate more profit, and allows your printer to generate more profit. Pick growth, or pick profit. It's time to choose. We all know that Amazon plows every penny of profit back into CapEx. Meanwhile, here in catalog land, we run a $50,000,000 business that generates $2,500,000 of pre-tax profit ... 5% ... not good ... not awful ... just a mediocre level of performance. Let's say that you took that $2,500,000 of pre-tax profit, and ran it back into what are currently unprofitable customer acquisition activities. Average Catalog Cost = $0.50. Expected $ per Book, Incremental 8,500,000 Co-Op Names = $0.70. Co-Op Cost = $0.06 Per Name. Extra Co-Op Mailings = 8,500,000. Extra Co-Op Demand = $5,950,000. Extra Co-Op Profit = $5,950,000*0.40 - 8,500,000*($0.50+$0.06) = -$2,380,000. Total Company Pre-Tax Profit = $2,500,000 -$2,380,000 = $120,000. Look at that. You just grew your top-line by 11.9%. Did you generate profit? No. This is what Amazon is doing. Your business is stalled at $50,000,000 and you cannot increase merchandise productivity. You are stuck. You could forgo profit ... all profit ... and invest every penny of anticipated profit with your co-op partners ... and your business might grow by 10% or 11% or 12%. You trade profit for growth. Do that for three or four years, and all of a sudden your $50 million dollar business is a $65 million dollar business. Do you want profit? If so, you limit growth. Do you want growth? If so, you limit profit. Here's a forecast model from last week. The marketer forecasts the business to grow, from $19.6 million to $22.6 million. That's good. But the numbers aren't based in science. The numbers are based in faith ... a belief that things will get better. Do not submit forecasts based on faith. At Eddie Bauer, in 1998, forecasts were based on faith. Every major department was asked to "sign up" (to "step up" in modern language) for increases. Creative signed up for 3%. Merchandising 5%. Marketing 4%. And all of a sudden, we had a 12% productivity increase. Anytime productivity increases, you can mail more customers, you can pay more for paid search terms, and you can send more email campaigns. In other words, the 12% productivity increase rippled through the system, causing marketing expense to increase by 10% or 15%, adding even more demand. There weren't any strategies/tactics underlying the increases. As a result, every year, Eddie Bauer forecast big sales increases. And two months into the season (each season was six months), sales were not meeting expectation (as one might "expect"). Markdowns ensued. Promotions were required (20% off plus free shipping). The discounts moved the merchandise, allowing us to get closer to our sales targets, but at greatly reduced profit levels. When I became accountable for the forecasting process, I "sandbagged" the forecast. In other words, I plugged in conservative estimates. Often, the estimates were identical to estimates from the prior year, sometimes, they were 2% or 3% below last year. Here is a forecast, using last year's actual outcomes. If assumptions remain the same, the business grows from $19.6 million to $20.1 million. The forecast authored earlier has demand growing to $22.6 million. This "delta", this difference, has to be communicated to your Executive Team. Your Executive Team must know where you business heads "as is", and where it heads with typical assumptions. At Eddie Bauer, we employed a year of sandbagged forecasts. Even though sales decreased marginally, we achieved a record year of profitability, all because we didn't have to liquidate merchandise, all because we forecast the business appropriately. At Nordstrom, the direct channel President demanded that I tell him what my base-line forecasts were, and he wanted to know if I sandbagged more than the base-line forecasts (I did). I knew that the online marketing team would be too aggressive in their forecasting, so I put a 3% drop into my forecasts, to account for the fact that the online marketing team would be so aggressive that they would cause the inventory team to over-buy merchandise. The President, a prior CFO of the business unit, always wanted to know the assumptions, and the reasons for the assumptions. Once Management realizes that you are trying to protect the business, Management will ask you to run numerous scenarios for them ... and you'll become an integral part of their team. I'm seeing trends that look an awful lot like 2002, folks. Back then, catalog shoppers were moving into e-commerce. And when you analyzed e-commerce buyers, they were not moving back to catalogs. Catalogers completely misinterpreted this dynamic as a sign that the catalog "caused" the shift to e-commerce - catalogers doubled-down and built the entire digital infrastructure to support catalogs. Big mistake. Today, catalogers are trapped with a 60+ year old customer base, calling me all the time, wondering how to appeal to a 37 year old shopper. E-commerce gurus are about to go through the same dynamic. I can see it, because I have the measurement tools to diagnose it, and because I lived through it 10-15 years ago. E-commerce gurus cannot see it, because they have every incentive to think that mobile is an extension of e-commerce. Mobile is not an extension of e-commerce. Mobile is different. When I analyze the numbers, I see two trends. The loyal e-commerce shopper is slowly migrating to mobile. The mobile shopper may go back to e-commerce, or may not go back. The second point is really important - because when you run simulations out over the next five years (you e-commerce folks are running five-year simulations, right? ), you can see that the business shifts away from e-commerce, to mobile. You can interpret this trend two ways. Desktop/Laptop/E-Commerce is the "core" of the business, mobile spins off of it, but is supported by Desktop/Laptop/E-Commerce. Mobile is different, and should be allowed to grow and thrive. I'm asking you to interpret it via #2. I know you're likely to interpret it via #1. #1 sends you down the path of the cataloger. #2 sends you into the future. If your customer is shifting to mobile, choose the future. In a "mobile first" world, the goal seems to be to dominate mobile. The goal should probably be to "understand mobile". 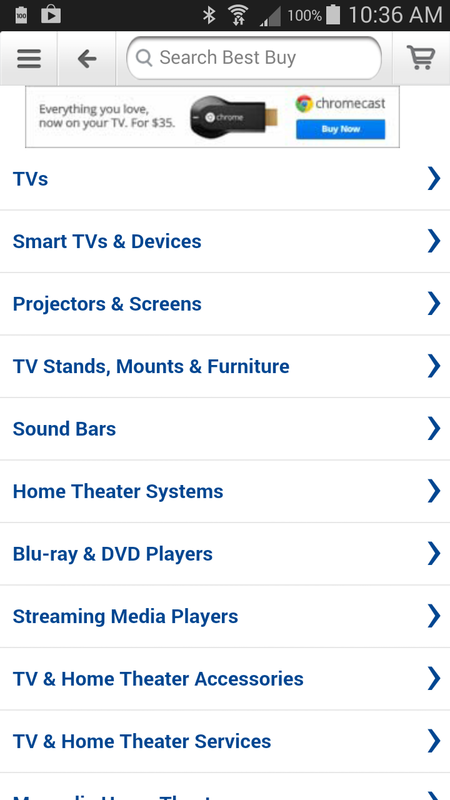 You see two screen shots from the Best Buy app in this post. Neither screen shot elicits a romantic shopping experience, and how the heck could they possibly elicit a romantic shopping experience? There's not enough real estate to present anything but boring text, and a handful of items after clicking on a boring link. Plenty of room, of course, to advertise Google Chromecast, of course, but that's a whole 'nuther story. The dynamics of the mobile user are different. Younger. Don't listen to the pundits who tell you that 77 year olds are playing Candy Crush and then are buying items via an Amazon App. Nonsense. These are largely customers under the age of 40. Yes, there will be the rogue 56 year old, fine. But look at the demographics as a cohort, and you'll see truth emerge. That truth, of course, is very important. Need: On your laptop, you can "browse". On your phone, you have a need, often previously identified. This is a different shopping experience, and should be treated as such. Here's the problem with mobile, based on my project work. The "need" that mobile serves causes a problem. When the customer needs something, the customer may well buy something. But the cross-shopping opportunities are reduced. Often, this results in a lower average order value, caused by fewer items per order. 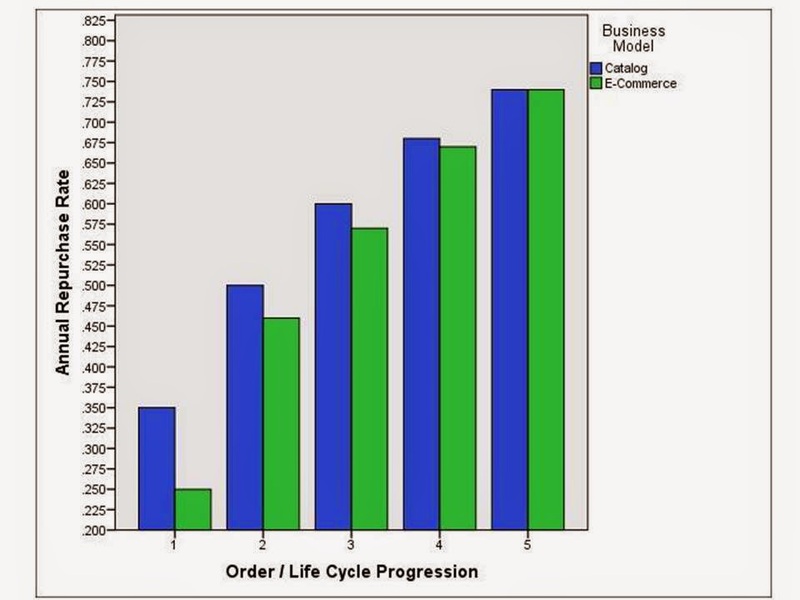 This creates a weaker future customer (customers buying more items per order are typically worth more in the future). This also reduces the size of the mobile merchandise assortment, giving fewer items a chance to achieve winning status. Pay close attention to these dynamics. Often, mobile is viewed as a positive channel for future sales potential. Just as often, mobile shrinks the assortment, hurting demand generation. Regardless of the forecasting system employed by companies, there is one common thread ... over-forecasting. Let's say that in 2014, your business will generate $19.6 million in demand, and will generate $1.0 million in pre-tax profit ... an approximate 5% pre-tax profit rate. Not good, not bad, just tepid, average. Somebody in Management is not going to be happy with another year of tepid results. This person will challenge the forecast to "push buttons", in an effort to move the business forward. Do not ever submit a forecast based on sales assumptions that are not backed by strategies or tactics. Look at the example above. The rebuy rate in 2015 is forecast to be 40% ... it was 38.5% last year. Unless there are strategies and/or tactics to move this metric, why forecast it to increase? Look at the reactivated and new buyer counts. Both are forecast to grow faster than in the past. Why? What are the strategies/tactics that yield the increases? Are there any? And are the strategies/tactics profitable? If not, who is going to sign off on the losses? Look at the spending figures. There is historical precedent to forecast an increase in spend, but again, there have to be strategies/tactics that back-up the forecast. Just six assumptions cause the business to grow from $19.6 million to $22.6 million, double the rate of growth from the prior year. Without tactics to defend sales growth, you're going to buy too much inventory, and you're going to have a veritable plethora of promotions to clear merchandise, killing profitability.